Mary Stewart is one of my favorite-but-forgotten-on-the-shelf authors. 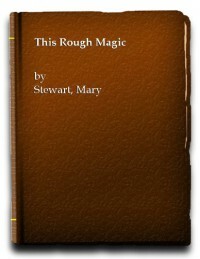 But even so, I had trouble with This Rough Magic. Maybe it's because I have never read The Tempest, but I found this novel really neither captured nor held my interest the way Ms. Stewart's other books have. It was a good read, but I would definitely recommend Airs Above the Ground, The Ivy Tree, or Nine Coaches Waiting before I would This Rough Magic.